Cruz De Fuego is a message in a bottle, and the message is, "Welcome." Welcome to Mexico, the most generous, most hospitable place on earth — a place where everything is shared. We express this by sharing with you the liquid art that is mezcal. make the spirits you will find in our bottles, and they make these spirits in a traditional way, using their five senses. It is one of the things that makes many mezcals and mezcal producers — maestros — so unique in the world of spirits. All alcohol begins life as sugar. The sugar source used to make every other alcohol you drink takes a maximum of six months to reach maturity. The grapes used to make the finest wines, the grains used to make the finest Scotch, the cane used to make the finest rums … none of these takes more than six months to reach maturity. But the sugars used to make mezcal come from the agave plant, and the fastest-growing agave varietal — the Blue Weber agave — takes a minimum of four years to reach maturity. Four years! And the Tepextate agave that Margarita and Carlos harvest to make their 100% Tepextate Mezcal can take up to 25 years to reach maturity. The result is a far more complex sugar, with far more aromatic elements. And those complexities reveal themselves in the end flavors of the spirit. Sugar is not the only thing that sets small mezcal producers apart from other spirits makers. Once those agave are harvested, they have to be prepared for fermentation. Like many of their peers, Margarita and Carlos roast their agave in stone-lined, earthen ovens. 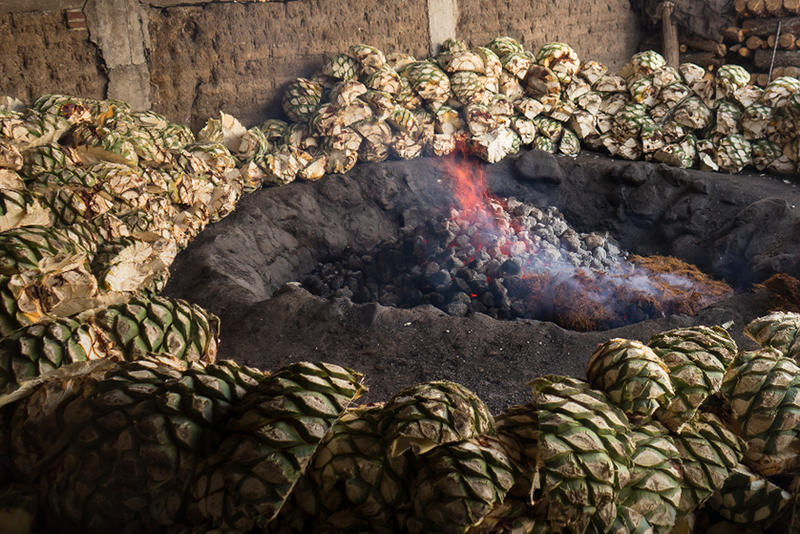 The oven is heated with wood fire for 12 hours before the agave are piled in and covered up with dirt, left to roast underground for five days. The roasted agave hearts are then milled, to release the caramelized sugars. This is done by a tahona — a stone wheel, pulled by a horse. This method of milling is much less efficient than a wood chipper. But Margarita and Carlos are not looking for efficiency — they are looking for flavor. And leaving some of the harder-to-reach sugars behind means leaving behind some of the less complex flavors. The juice and fibers from the milled agave are then collected and placed in open-air, wooden barrels, where water is added. This is where fermentation starts — where yeast begins to eat the sugars and produce alcohol and CO2. With almost every other alcohol you consume, this process is done in a closed system, and a specific yeast is added. The reason for this is two-fold: the yeast is added so that the distiller can better ensure a consistent flavor in their alcohol, and the system is closed to keep out wild yeasts and the bacteria that consumes alcohol and turns it into acetic acid, more commonly known as vinegar. 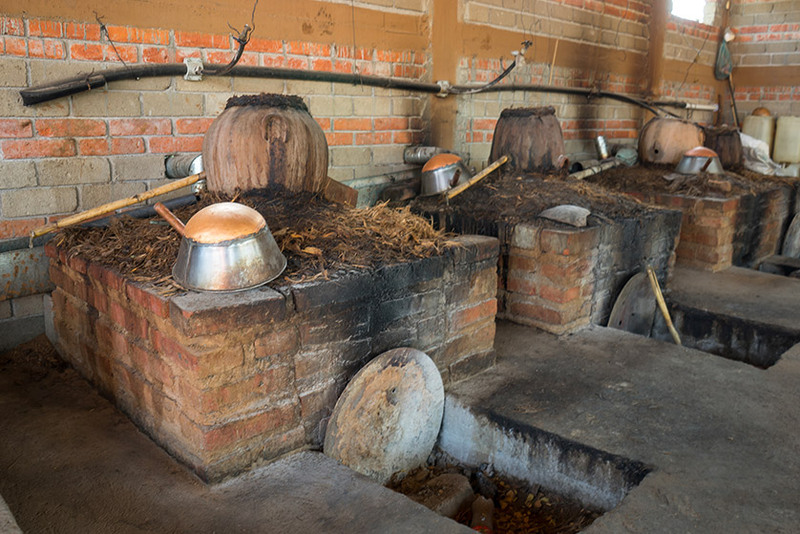 Margarita and Carlos — and their peers making artisanal and ancestral mezcals — ferment using wild yeasts in an open-air environment so that each batch tastes unique. During one season, the avocado trees on their property will be budding, and the predominant yeast will come from there; during another season, it may be the yeast from the oranges that dominates. And that bacteria that wants to turn the entire batch into vinegar? It gets its foot in the door, adding flavor, too. A little bit of sour helps balance the sweetness of the agave. Once fermentation is where Margarita and Carlos want it to be, they quickly to get the liquid distilled. The fermented juice that isn't being worked in the still is sitting in that open-air fermenter … changing every minute. The fermenters hold 2,000 liters and the still only holds 350 liters, so there's no room for delay, and no sleep until everything has been run through the still once — that often means maestros are awake for 24 to 48 hours straight, distilling. And the stills they use, they're not the kind with dials and knobs that every other spirits industry uses. To understand what that means, you need to understand the process of distillation. Distillation is the process of separating the alcohol from the water. When you drink wine, it can be 15% alcohol by volume. That means it is 85% water. The fermented agave is much like that: 15% alcohol, 85% water. But when it gets bottled and sold to you, it's 45% alcohol or higher. That additional 30% alcohol is achieved by separating the alcohol from the water. The boiling point of alcohol is 173 degrees and the boiling point of water is 212 degrees. You want to get your still heated to above 173 degrees, but below 212, so that the alcohol becomes a vapor and travels up out of the still and the water remains behind, still a liquid. Almost every spirit you taste was made in a modern still, where the master distiller dials the knob to 180 degrees and presses the start button. 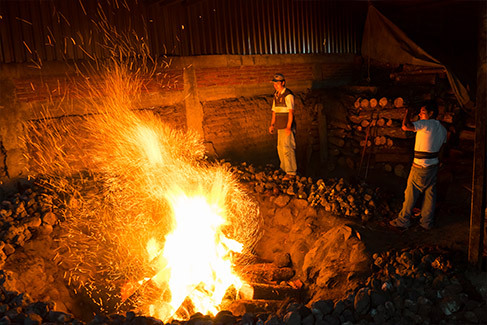 What Maestro Mezcaleros like Margarita and Carlos do is, they set fire to wood placed under their copper pot stills, and they use their hands to determine if the temperature is right. If it's too hot, they move the wood away from the still a bit; if it's not hot enough, they add a bit of wood. This happens for the entire run which, again, can be 24 to 48 hours straight. With modern distillation, you're getting exact science. With maestro mezcaleros, you're getting refined artistry. Small inconsistencies create subtle and distinct flavors, like the multiple notes that work together to become symphonies. These symphonies are what we share with you in every bottle of Cruz De Fuego. They are the stories of the triumphs and hopes of the people of Mexico, and of the heartaches and struggles of those people. Sharing the joy of agave, tradition, and taste.